In the past, water filter brand Brita has targeted plastic bottles as public enemy No. 1, but now it has its sights on a new foe: soda. A new spot created by DDB California uses towering piles of sugar cubes to show the impact of drinking one sugary soda a day (which would be pretty a moderate intake for some families). 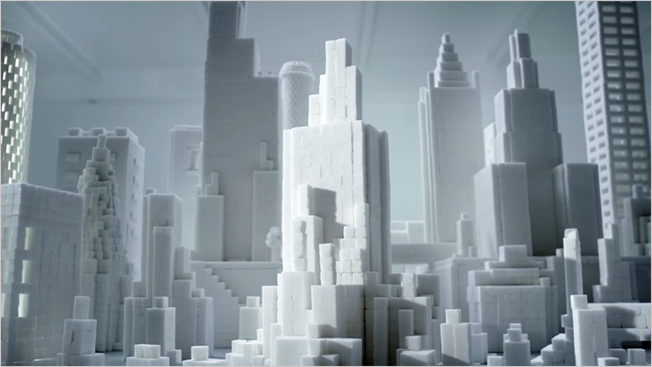 In the ad, we see a stack of cubes illustrating a single day of cola, followed by a skyscraper modeled from a year's sugar, ending on a cityscape built from the 221,314 sugar cubes a soda fan could consume "over an average adult lifetime." The sculpture features 28 buildings, varying in height from 2 to 7 feet. That's one tall drink of terrifying.